The merger of these two highly respected journals means an enhanced depth, diligence and efficiency of the OLJ for our readers. Online Learning is the official journal of the Online Learning Consortium, which promotes the development and dissemination of new knowledge at the intersection of pedagogy, emerging technology, policy, and practice in online environments. This journal, now in its 20th release, has been in publication for two decades and is known to many as JALN, the Journal of Asynchronous Learning. With the advent of our organization’s name change, we’ve renamed our signature journal, Online Learning a journal of the Online Learning Consortium. Although our name has changed, our aim and mission has not, which is to provide scholars, practitioners, administrators, and policy makers in online education with knowledge about the very best research in online learning. The aim of Online Learning (formerly the Journal of Asynchronous Learning Networks, JALN) is to promote the development and dissemination of new knowledge at the intersection of pedagogy, emerging technology, policy, and practice in online environments. Our mission is to provide scholars, practitioners, administrators, and policy makers in online education with knowledge about the very best research in online learning. Papers building on and/or developing theory and supported by rigorous methods are the norm. Occasionally, papers reviewing broad areas are published, including critical reviews of thematic areas. Online Learning is published 4 times a year, and entire issues are published from time-to-time around a single topic or disciplinary areas. Calls for papers for special issues include specific due dates, but general submissions are accepted year-round. The journal adheres to traditional standards of double-blind peer review, and authors are asked to provide systematic data in support of claims. Currently the acceptance rate for Online Learning is 25%. For more information about the journal, please review the information in the various links located in the right column or contact us at olj@onlinelearning-c.org. We invite high quality manuscripts for blind peer-review on a wide variety of topics including but not limited to those that investigate how online environments amplify, shape, and constrain teaching and learning. We welcome submissions that systematically investigate questions around online interaction, collaboration, individualized instruction, multimedia, adaptive environments, blended learning, issues of learning at scale (in both MOOCs and “traditional” online learning environments); emerging technologies; analysis of large data sets in understanding online educational processes; and effective approaches and interventions that promote online student engagement, persistence, improvement, and success. We also solicit cutting edge research on how new technologies and the practices they enable urge us to reconsider policy and practice in educational settings. Occasionally, papers reviewing broad areas are published, including critical reviews of thematic areas. Papers useful to administrators are welcome. Online Learning is published 4 times a year, and entire issues are published from time-to-time around a single topic or disciplinary areas. Calls for papers for special issues include specific due dates, but general submissions are accepted year-round. The journal adheres to traditional standards of double-blind peer review, and authors are encouraged to provide data in support of claims; currently the acceptance rate is approximately 25%. The journal is guided by its editors and advisory panels. If you are interested in contributing as an author or reviewer, please see guidelines and information for authors, reviewers and researchers. You can find the journal in these databases: EBSCO, ERIC, H.W. Wilson Company, Cabell Publishing Inc., ERA Online, Ulrichs Web, Index Copernicus and the OLC is a supporter of the Directory of Open Access Journals. 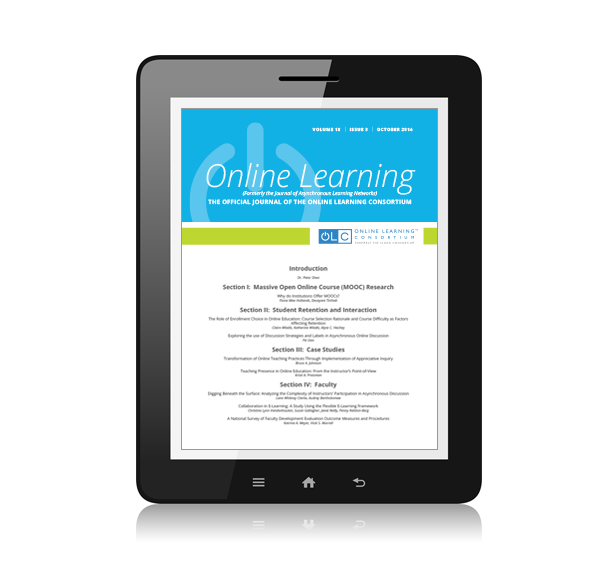 For more information about the journal and other publications visit https://onlinelearningconsortium.org/read or contact us at olj@onlinelearning-c.org.